Before I wrote my Arthur trilogy, I tried several times to map a route through the attractive, perilous world of Arthurian legend. First, I retold little-known legends but my versions were dry as dust and I threw them away; then I attempted to write a novel about Sir Thomas Malory in prison incorporating a number of legends; I wrote six BBC radio plays; and then I was commissioned to write simple, straightforward retellings for children, grouped according to topic – magic, love, kingship, and so on. But I wanted to challenge myself, and grow, or perish in the attempt. When I stared at the stone, I could see myself inside it. It was black of black, and deep, and very still. Like an eye of deep water. What, I wondered, should I call this boy? Arthur? Yes, let my Arthur discover his namesake in the stone. So when and where should the historical strand be set? At the end of the twelfth and beginning of the thirteenth centuries, I thought, because this is precisely when King Arthur was about to enter the literary mainstream and become the pan-European hero; and in some potent borderland, because my young Arthur will be crossing from childhood into adulthood, and because there will be a continuous interplay between the actual world (rough, gruff, tough, early medieval England) and the imaginative world of Arthurian legend. I didn’t have to think twice: I knew the setting should be the magical Welsh Marches so rich in Arthurian association, here secretive, there expansive, looking east to plainspoken England, looking west to dreaming Wales. I began to research, and to plan. I immersed myself in books not only about the fabric of medieval life but, so much more difficult to get at, the temper and imagination of the medieval world. I read Le Ménagier de Paris’s domestic advice to his young wife and contemporary accounts of the crusades not only by Villehardouin and Robert of Clari but by Islamic writers. I read and reread Geoffrey of Monmouth, Sir Thomas Malory, Chrétien de Troyes, the lais of Marie de France, Perlesvaus, Culhwch and Olwen, the Vulgate Version, the anonymous Alliterative Morte Arthure, ranging further and further afield in search of likely candidates. But I also read historical fiction for children by living writers, and if there is one book that set me on fire and emboldened me to write in the first person, it is Karen Cushman’s wonderful Catherine, Called Birdy. I visited museums, national and local, sometimes haphazard and dusty. I talked to medievalists, especially my generous friend (and Arthurian scholar) Richard Barber, author of the recently published The Holy Grail. I visited and revisited places in the Marches, in particular Stokesay Castle, the fortified manor I adopted as my Caldicot, as well as Venice and Zadar in Croatia where, in one of the most disgraceful episodes in the disastrous Fourth Crusade, Christian crusaders laid siege to a Christian city. Zadar (once known as Zara) is the theatre for much of the action in King of the Middle March. 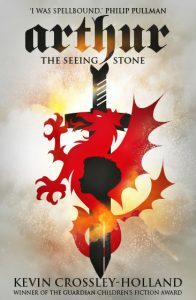 As I began to get to know my Arthur de Caldicot, and to think about the legends he would see in his obsidian, it soon became clear that I was letting myself in not for one book but a trilogy. Frankly, this scared me. I had only recently concluded that I wasn’t capable of writing a novel, and now here I was proposing to write three. But I also saw there was no way round this if I were to explore in some detail the fabric and temper of medieval life and to engage full-bloodedly with the three phases of Arthurian legend: that is to say, Arthur’s childhood, the glory of Camelot, and Camelot’s decline and fall. The Arthur trilogy has now been published in twenty-five languages and has sold almost two million copies. 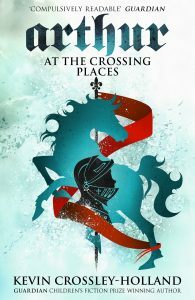 The first book, The Seeing Stone won the Guardian Children’s Fiction Award, the Tir na n-Og Award, and the Smarties Prize Bronze Medal, and was followed by At the Crossing-Places and King of the Middle March. Orion has also published the trilogy in their adult Phoenix editions. Kevin’s account of Gatty’s Tale has just been reprinted by Orion Books. Gatty is perhaps the most loved of Kevin’s heroines. In the year 1203, nine companions set out on a great pilgrimage. The journey “on foot, on horseback and by sea” is fraught with danger. Not all of them will come home. Among them is a girl called Gatty, whose whole life has been spent working in the fields, who has never been more than a few miles from home, who knows hunger and hardship and little else. 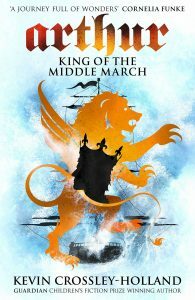 Bright, eager and resolute, she is at the heart of this enthralling novel that sweeps across Europe towards Jerusalem, carrying the pilgrims through great highs and lows and knuckle-biting dramas. Thieves and conmen; a vicious attack; storms and precipices; broken limbs and a heartbreaking bereavement; these are the challenges and terrors the pilgrims must face. But this is also a story of friendship and loyalty, bravery and sacrifice. Gatty’s curiosity and reckless impulsiveness land her in danger but also open her to new people and new ideas. Passionate with hope and love and longing, she is transformed by her experience, and discovers in herself the capacity to be far more than the simple field-girl she once was. Will she reach Jerusalem? Will she return home, and see again the Welsh Marches and the one person she can tell her heart to? The hardback was published in October 2006 and the paperback in September 2007. After she had read the first book in my Arthur trilogy, a distinguished writer-friend wrote to me saying how surprised she was because she didn’t think I had it in me to devise an intricate jigsaw or to lead readers on the elaborate dance of a novel. Just so! True, I did write one-and-a-half novels as a student (one was about Anglo-Indian relationships) now in the Brotherton Collection; and true, my first two books for children were such free retellings of the 13th century romances Havelok the Dane and King Horn as to justify being called fiction. But all the same, their plots and psychological dramas derived from their medieval authors. In 1968, Jill Paton Walsh and I wrote Wordhoard, a collection of ten Anglo-Saxon stories for children, and were bucked by Alan Garner’s praise for them. And then, in my early thirties, I wrote three short stories about an Anglo-Saxon boy (The Sea Stranger, The Fire-Brother and The Earth-Father), subsequently published as one (still short) novel, Wulf. My next excursion into fiction was a short ghost story, Storm, set on the north Norfolk coast. To universal astonishment, this was awarded the Carnegie Medal. My great good fortune was to be in the right place at the right time, when there was a powerful lobby for the recognition of writing for younger children. What this unexpected recognition gave me was confidence – the self-belief to go further than before, and the knowledge that people would be likely to read what I wrote. But not, for all that, the confidence or even the desire to write full-length fiction. So I came to the fiction table late, and somehow despite myself. I wanted to find a valuable and revealing way of approaching Arthurian romance and my solution was the Arthur trilogy: historical fiction incorporating, anticipating and reflecting legend. So purists could well say that Gatty’s Tale, in which a village girl makes a pilgrimage in 1203 from the Welsh Marches to Jerusalem, was really my first full-length novel. Waterslain Angels was my first novel set in north Norfolk. Two children set off in pursuit of the angels missing from the hammerbeam roof in the local church, but as they follow one clue after another, they’re up against stiff competition and life-threatening hazards.